Here we are, at the 15th Mixology Monday! This month’s host, Matt from My Bar Your Bar, chose as his theme tequila. Now, I’m really just getting used to tequila. Jen and I don’t drink it often, so I’m still learning how it plays with other flavors. With that in mind, I wanted a simple drink, one that would allow me to test and tinker without having four or more ingredients to futz with. So I went with the classic margarita, but I swapped out the triple sec for some pear liqueur. I wanted to just switch fruits–pear for orange–and see how it worked. And, in the end, we liked it. 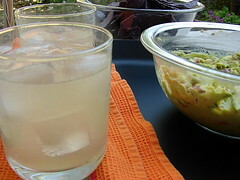 Jen made up a batch of guacamole and we sat out back on a sunny Sunday with icy drinks, chips, and guac. Technique: Shake over ice and strain into a chilled cocktail glass, or use twice the ingredients, as I did, and strain into an ice-filled Old Fashioned glass. Yum — I am all about the pear. What kind of pear liqueur did you use? Eau de vie-style or cognac-type? I’ve edited my post to include both a photo of the drink and the name of the liqueur I used.